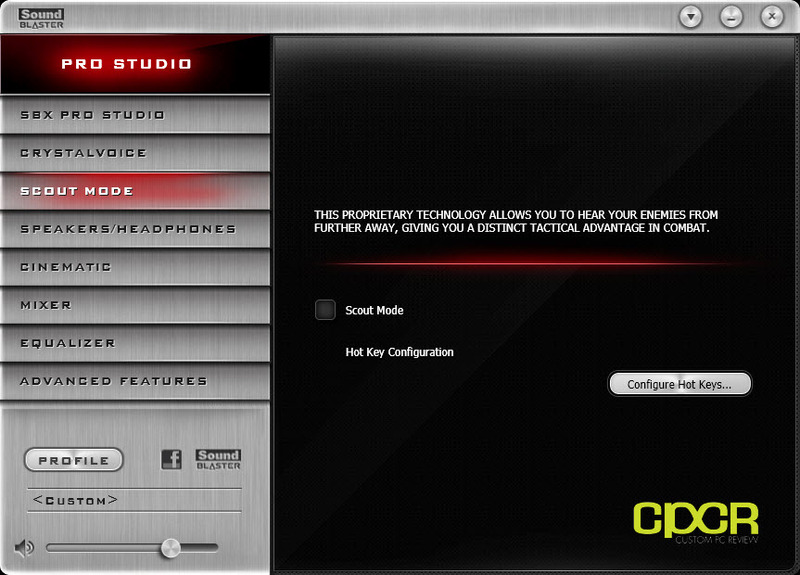 Back in 2011, Creative unveiled the Recon 3D series of soundcards based off their (at the time) new Sound Core 3D chipset, which were decent soundcards for gaming and general audio, but didn’t include any real audio processing hardware (DACs, ADCs, etc.) other than the Sound Core 3D chipset itself. While the Sound Core 3D chipset is definitely impressive especially with its audio processing ability and lower power consumption, the problem with this is that with proper headphones and speakers, the sound quality on the Recon 3D series soundcards couldn’t match older Sound Blaster X-Fi soundcards such as the Sound Blaster X-Fi Titanium, X-Fi Titanium HD, and even the older Audigy 2 cards, which sported superior audio hardware when compared to the Recon 3D series. 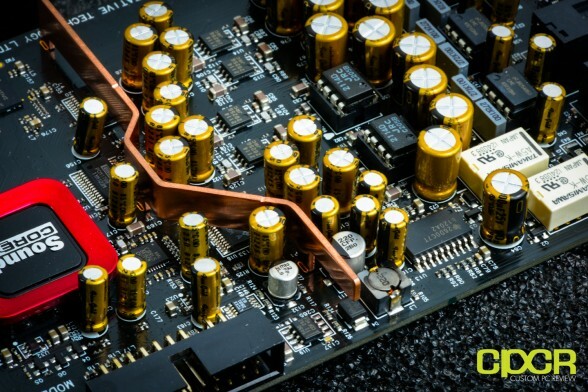 This unfortunately led many audio enthusiasts and audiophiles to dismiss the Recon 3D series, which allowed other vendors such as ASUS for example to capture a large portion of the dedicated soundcard market previously dominated by Creative. 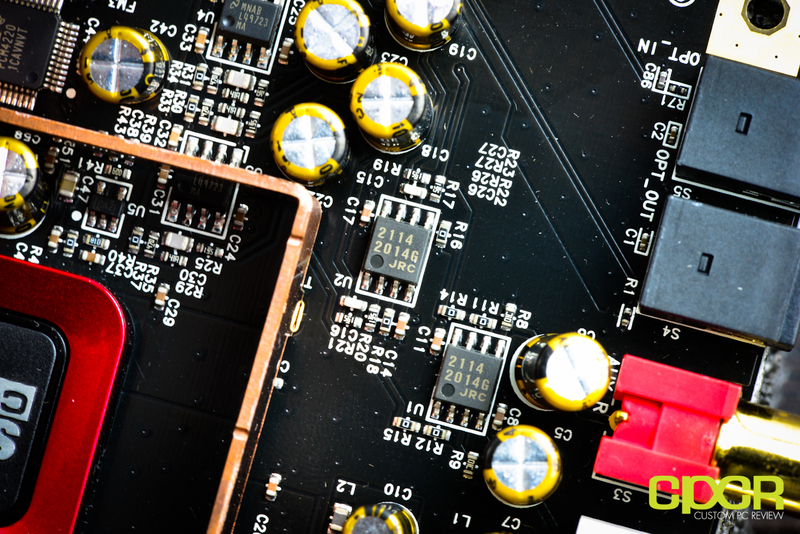 Late last year, only a year after the introduction of the Recon 3D series of soundcards, Creative unveiled the new Sound Blaster Z series of soundcards. 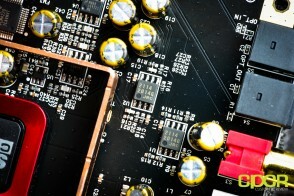 Unlike the Sound Blaster Recon 3D series of soundcards, the Sound Blaster Z series soundcards carried real audio hardware such as dedicated Op-Amps, ADCs, and DACs, which greatly improved sound quality in addition to the Sound Core 3D audio processing chip – something that that Sound Blaster Recon 3D failed to do. 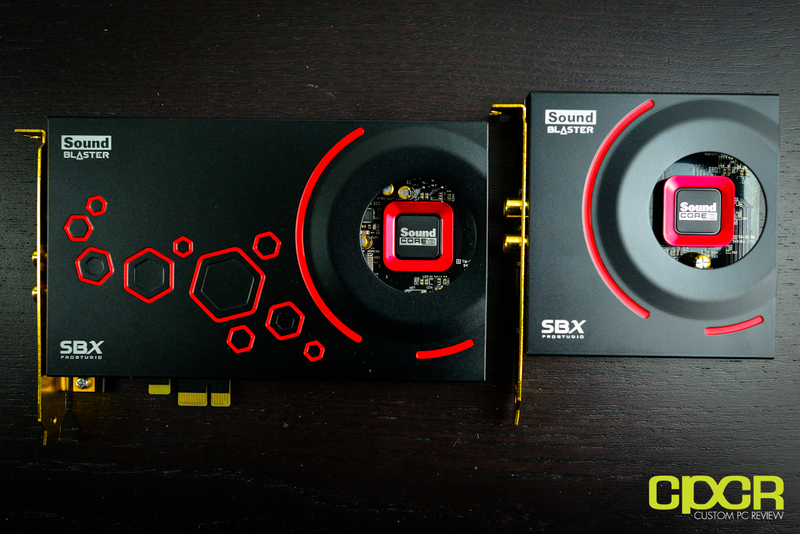 That being said, today we’ll be reviewing the Creative Sound Blaster ZxR, which is the flagship soundcard in the Sound Blaster Z series of soundcards. 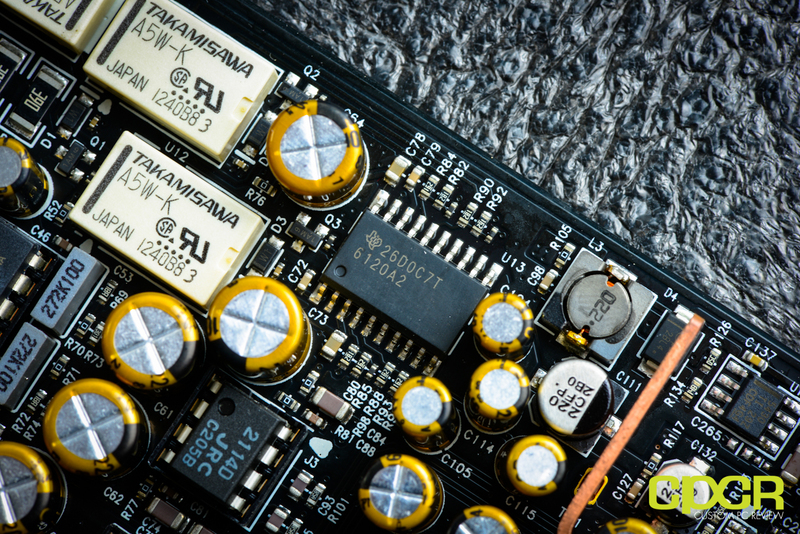 Now a couple months ago, we reviewed the Sound Blaster Z, which is a fantastic soundcard that offered a good balance between sound quality and price, but it’s merely the entry level soundcard in the Sound Blaster Z. 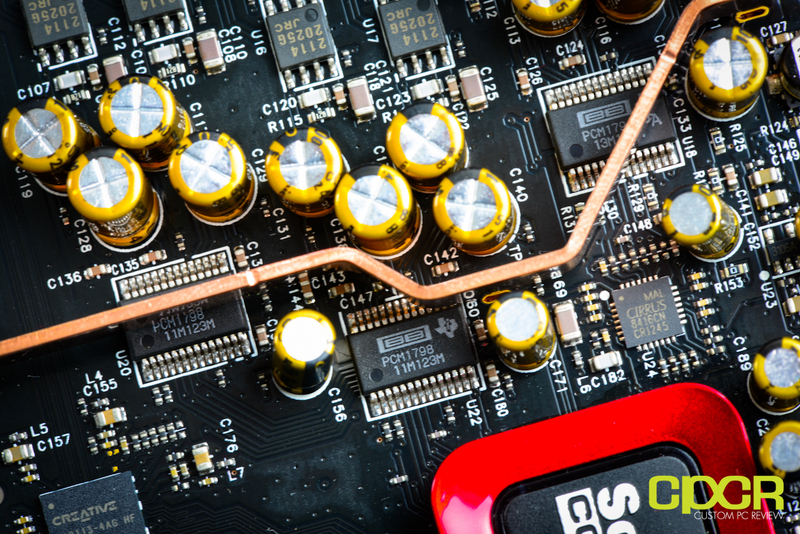 With the Sound Blaster ZxR, Creative has made a number of changes and additions to cater more specifically to the audio enthusiast/audiophile crowd, so let’s dive in! 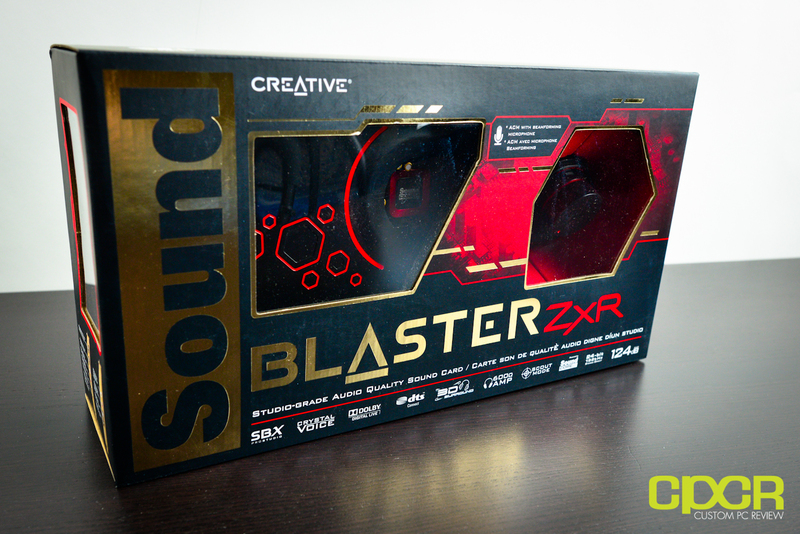 Here’s a look at the packaging for the Sound Blaster ZxR. 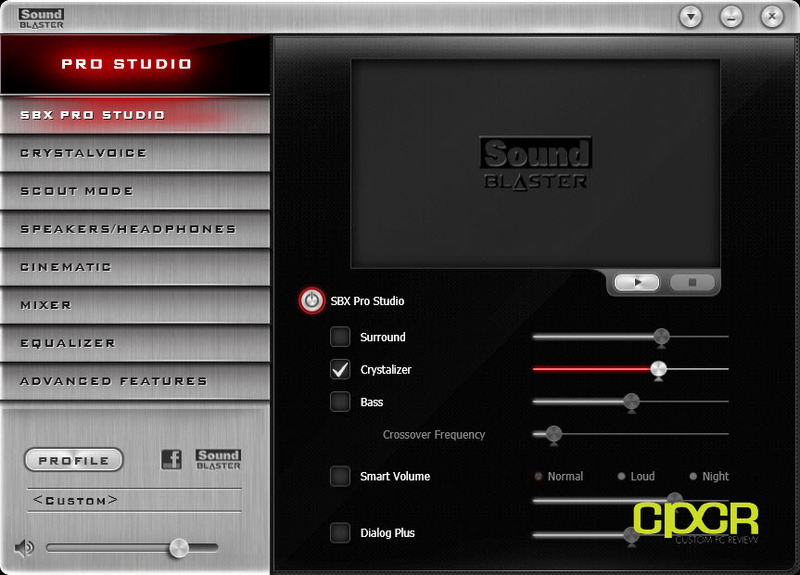 The front of the box is plastered with numerous features along with windows displaying the soundcard and the ACM module. 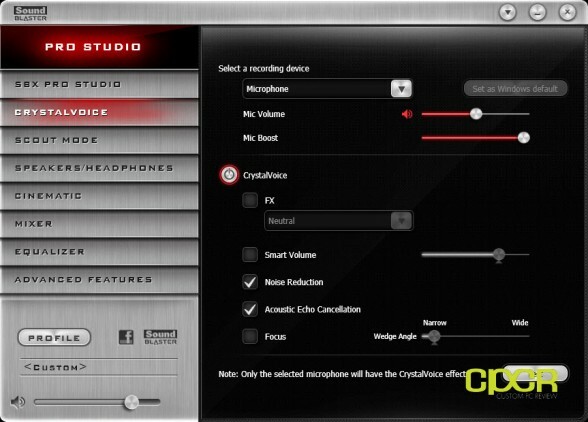 Along with software such as SBX Pro Studio, Crystal Voice, etc. Creative is particularly proud about being able to reach a 124dB SNR with the Sound Blaster ZxR. 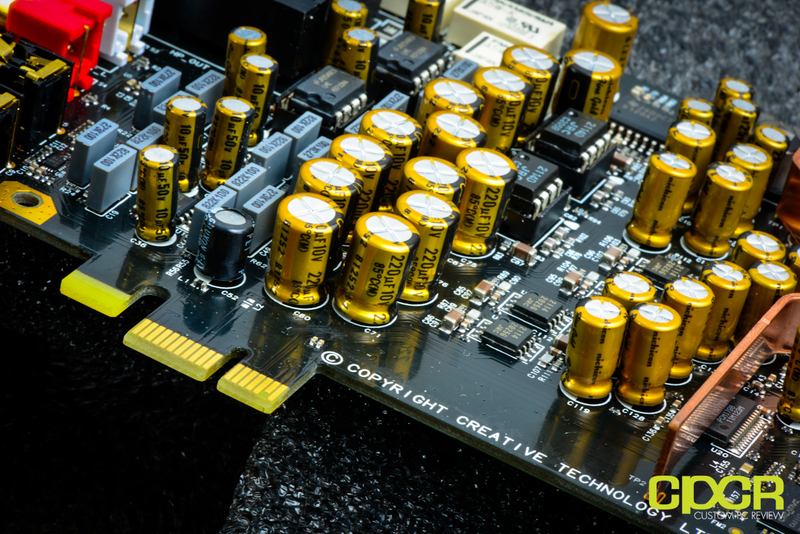 Very few soundcards on the market are capable of reaching such a high SNR, including Creative’s previous audiophile grade soundcard, the Sound Blaster X-Fi Titanium HD. Digging into the packaging, let’s take a look at the accessories. 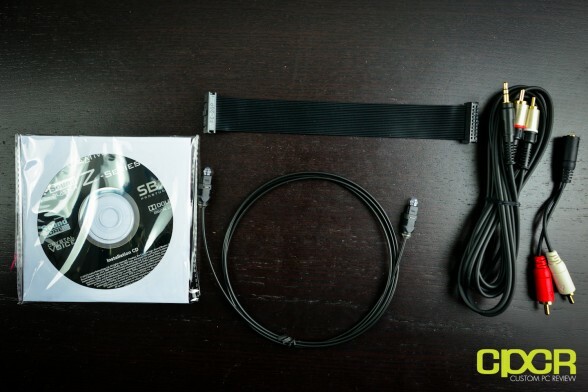 Included we get some documentation, a driver disk, an optical cable, a 3.5mm (male) to RCA (male) cable, a 3.5mm (female) to RCA (male) adapter, and a proprietary connector that interfaces the soundcard with the daughterboard. We’ll discuss that in a little bit. 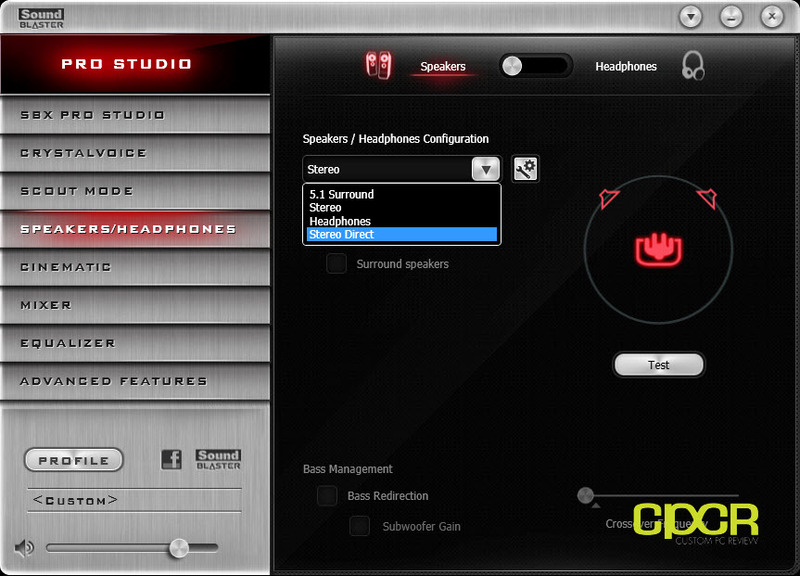 We also get the Audio Control Module (ACM). The ACM is an external audio control module that includes a built in microphone array, a large volume control knob, 3.5mm headphone/microphone outputs and 1/4″ headphone/microphone outputs. The ACM interfaces with the Sound Blaster ZxR via 3.5mm headphone/microphone connectors, but Creative has also included 3.5mm to 1/4″ adapters as well for interfacing with the sound card. Now something a lot of people may not realize is that while there are a lot of methods for passing 3.5mm audio outputs such as front panel audio on cases or audio passthroughs on gaming keyboards, these passthroughs may not always be of high quality. 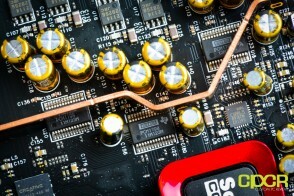 Most of the time, directly connecting a pair of headphones to a higher end soundcard will tend to sound better than when it’s connected via say the case’s front panel audio. The ACM on the other hand, is a high quality audio passthrough, which means audio piped through the ACM will sound identical to audio coming directly from the soundcard. 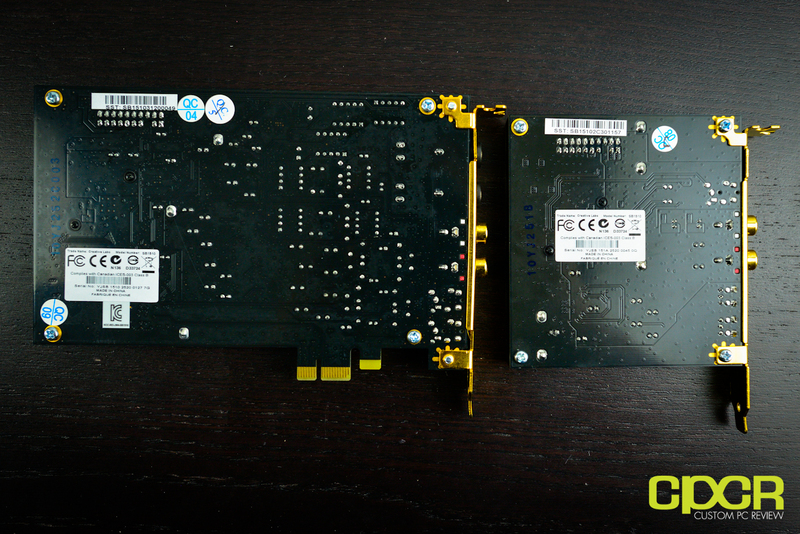 Finally, let’s also take a look at the Sound Blaster ZxR itself along with the DBPro daughter board. 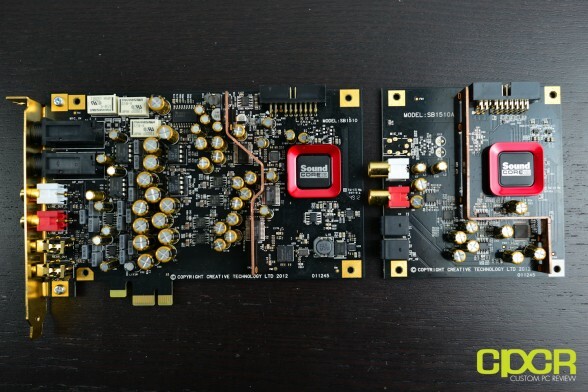 While overall design of the card is similar to what we saw from the Sound Blaster Z, the ZxR is a slightly longer card and has a more blacked out color scheme on its EMI shield than what we saw on the Sound Blaster Z. As usual, it uses a PCIe 1x interface, so the card may be installed in PCIe 1x, 4x, 8x, and 16x slots on your motherboard. Since the DBPro daughter card doesn’t have a PCIe or USB interface, it connects via a proprietary connector that runs between the primary Sound Blaster ZxR PCB and the DBPro daughter board. 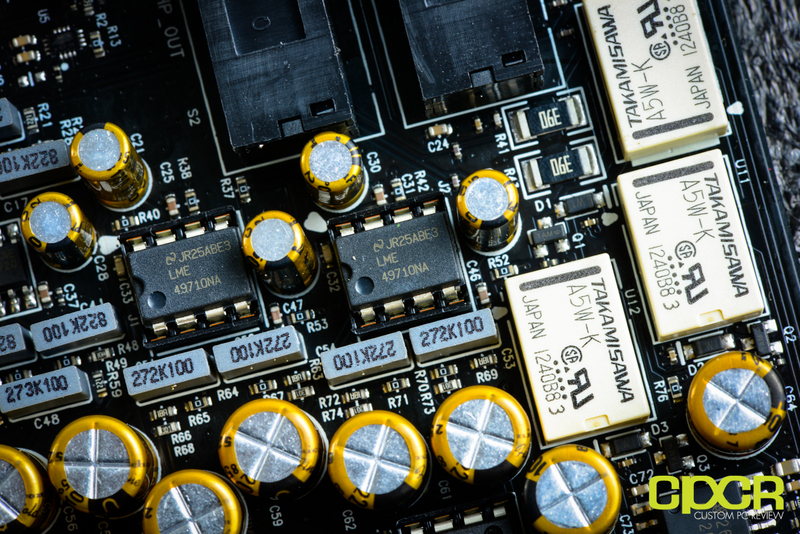 The DBPro daughter board does not need to be installed for the main board to work; however, you’ll be losing the optical interface along with the line in as well. With the Sound Blaster ZxR, we’re definitely not short on connectivity options. The primary Sound Blaster ZxR card includes 1x 1/4″ headphone jack, 1x 1/4″ microphone jack, 2x RCA out (L/R speaker), and 2x 3.5mm jacks (rear, c/sub) as well. The DBPro daughter card includes 2x RCA line in, 1x optical in and 1x optical out. 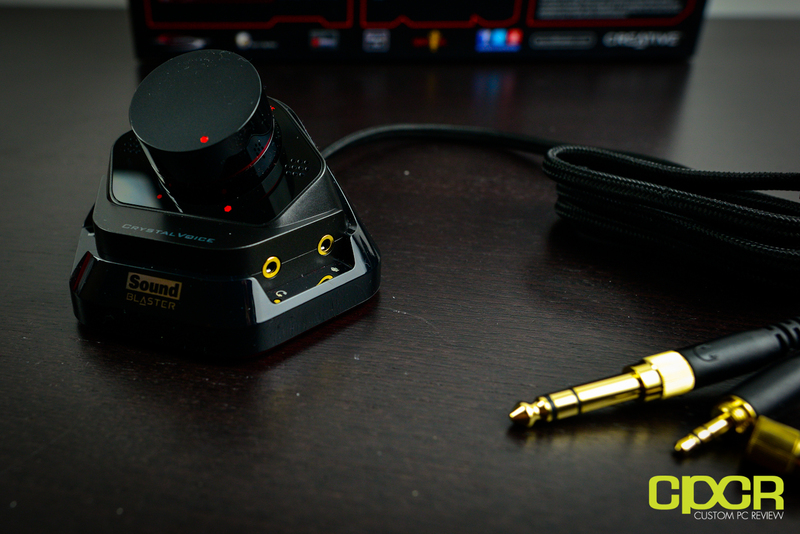 For those without enthusiast/audiophile grade headphones that use 1/4″ jacks, you must use the ACM to interface your 3.5mm jacks with the soundcard or purchase a 1/4″ to 3.5mm adapter. Here’s a look at the rear of the card. There’s not much to see here here, but Creative is using a black PCB. 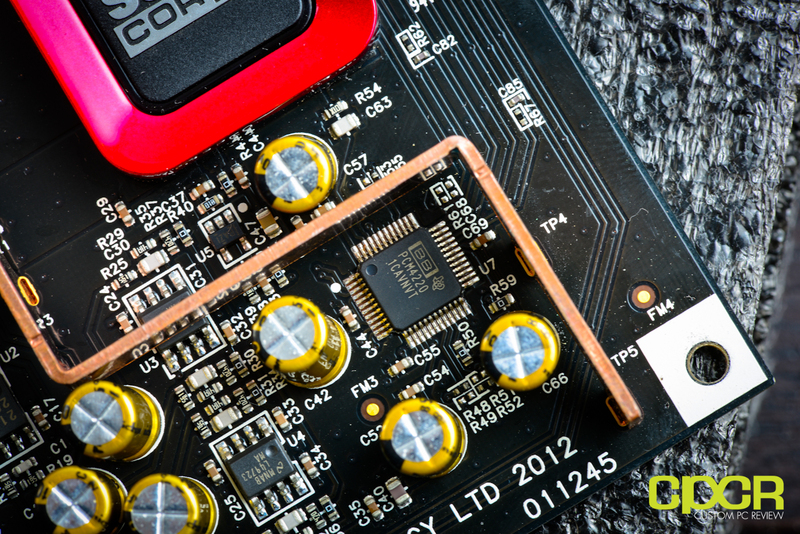 Since most of the sound card and the daughter board is covered with an EMI shield, let’s pull that off and take a closer look at the type of components used on the card. 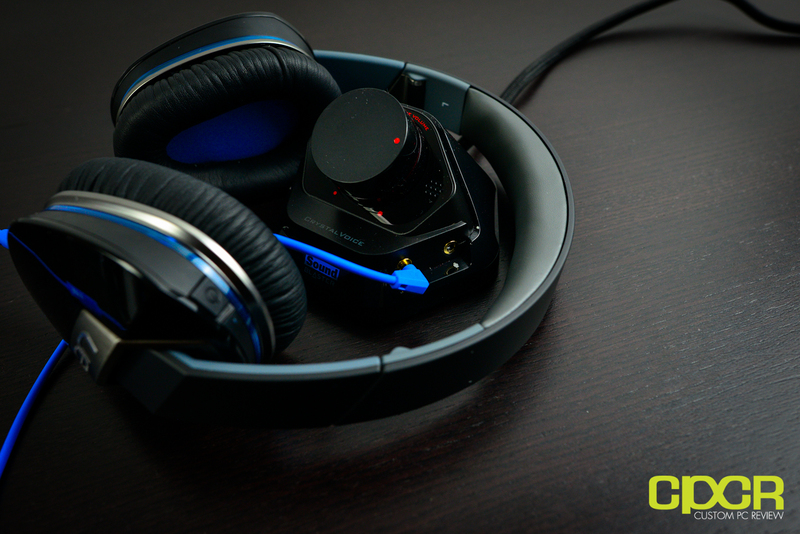 This will give us a general idea of how well the sound card will perform. 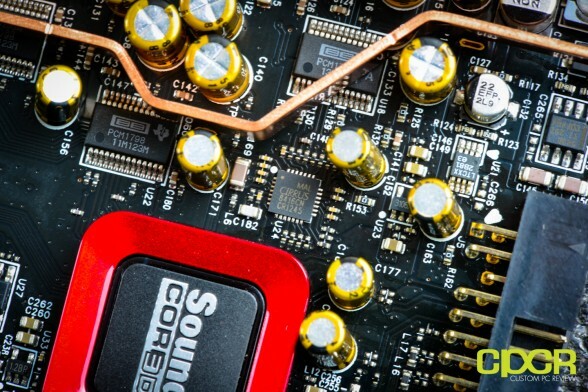 From first glance though, it’s quite obvious that the Sound Blaster ZxR has a whole helluva lot more going on than both the Sound Blaster Z. Let’s take a closer look. First thing you’ll notice is that on both the Sound Blaster ZxR main card and the DBPro daughter card there’s an EMI divider that divides the analog and digital sections of the sound card. This ensures that interference from either the analog or digital portions of the boards don’t cross over. Safe to say, this along with many other factors contribute to why Creative has been able to achieve up to a 124dB SNR. 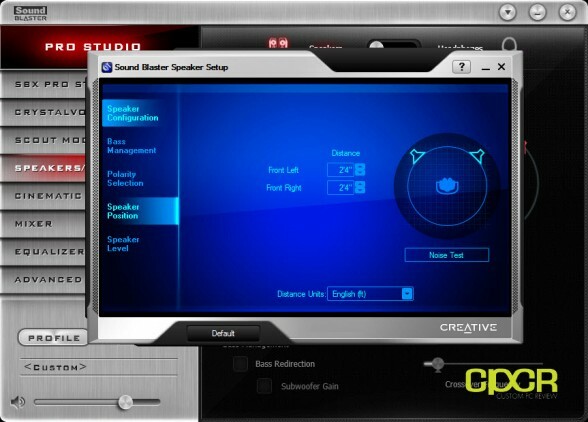 Like Creative’s entire Sound Blaster Z series of sound cards, the Sound Blaster ZxR utilizes the Creative CA0113-4AG audio processor, which most of you know as the Sound Core 3D audio processor. 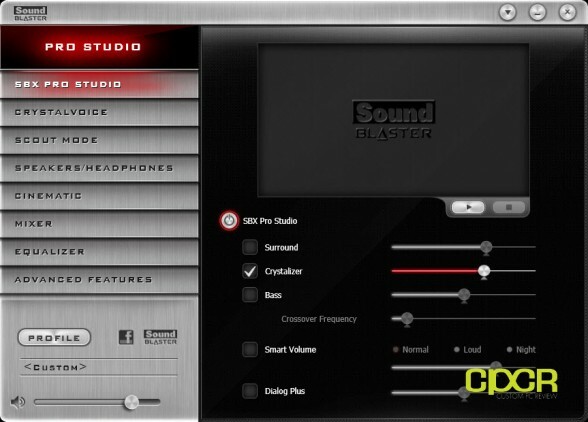 We’ve talked about this chip more extensively in our review of the Sound Blaster Z, but it’s essentially a 4 core audio processor that handles all the special features in the software such as SBX Pro Studio, Crystal Voice, Dolby Digital Live encoding, etc. 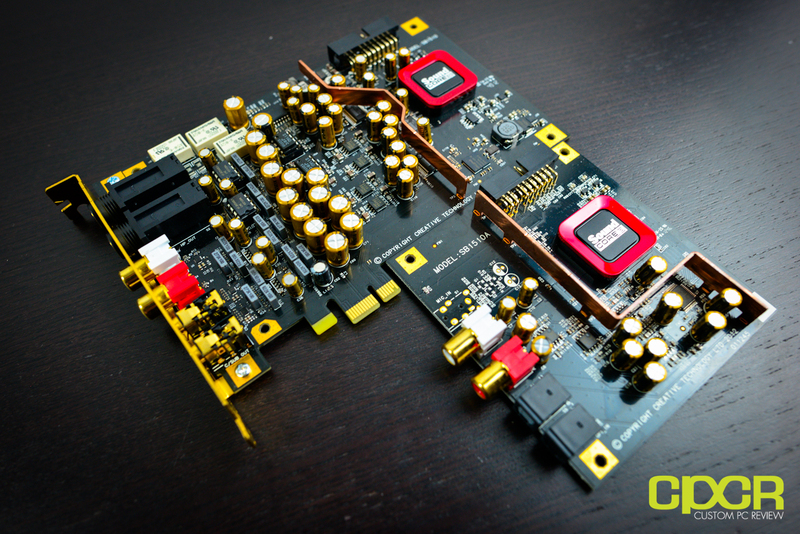 Since the Sound Blaster ZxR is designed for audio enthusiasts and audiophiles, Creative has included four replaceable op amps, which are located on the main board. The stock op amps include two LME 49710NA and two JRC 2114D. 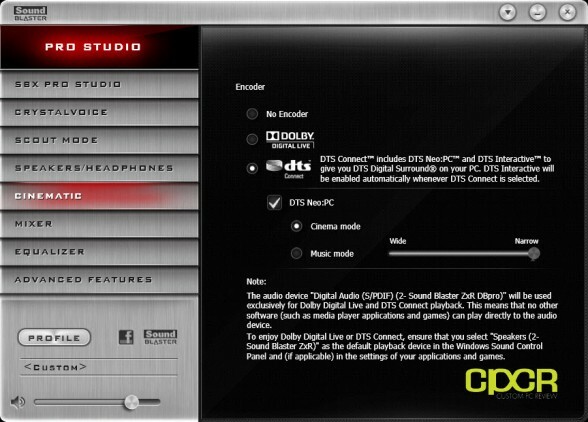 Here’s a look at the main DACs (Digital to Analog Converter) along with the headphone amp as well. The Front L/R DACs consists of Burr-Brown PCM1794 while the Rear/C/Sub DACs consist of Burr-Brown PCM1798. 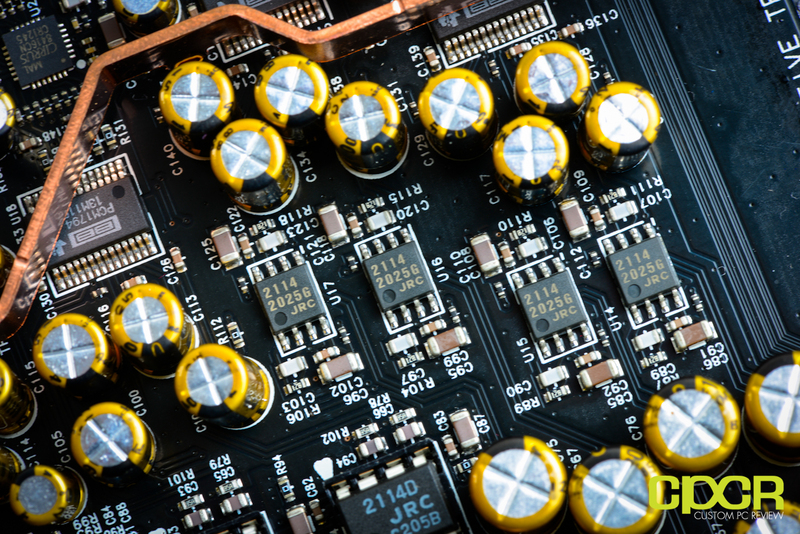 Additionally, the main board is also scattered with a number of JRC 2114 op amps as well. Here’s a look at the Cirrus Logic 8416CN 192 kHz digital audio interface receiver. 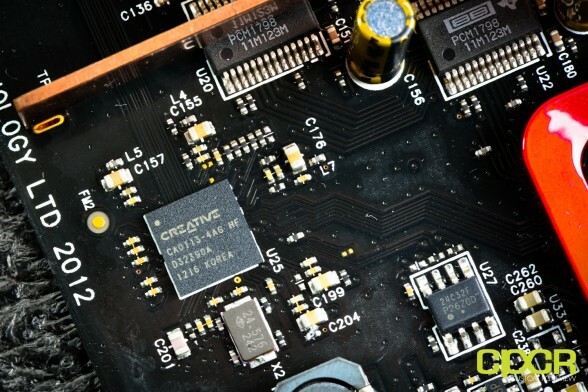 Interestingly, this chip is located on the main board rather than the DBPro daughter board, which actually houses the optical in/optical out connector. Here’s a look at the DBPro daughter board. For the Sound Blaster ZxR, Creative is using the Burr-Brown PCM4220 ADC (analog to digital converter). 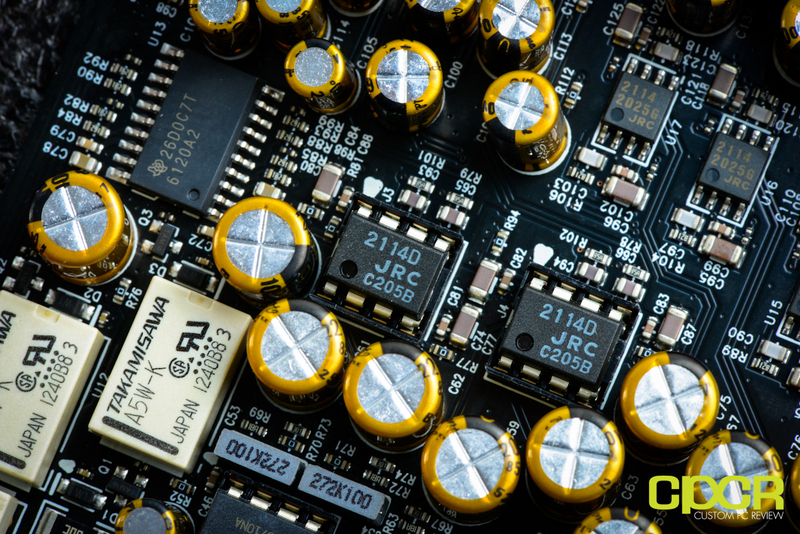 Along with the Burr-Brown PCM 4220 ADC, the DBPro board also houses a number of JRC 2114 op-amps as well. Here’s a look at the capacitors on Sound Blaster ZxR. Creative is using Nichicon Muse series Fine Gold (FG) capacitors. These are Japanese made capacitors specifically designed for audio applications. Let’s take a look at the software for the Sound Blaster ZxR. I’m not going to go too in depth on the software since it’s been covered in the review of the Sound Blaster Z and it’s pretty much identical. Those interested in learning more about the software itself can take a look at the software portion of the Sound Blaster Z review. The main update to the software is the inclusion of ASIO support, which is now standard with the latest Creative SBX Pro Studio driver suite available via Creative’s website. 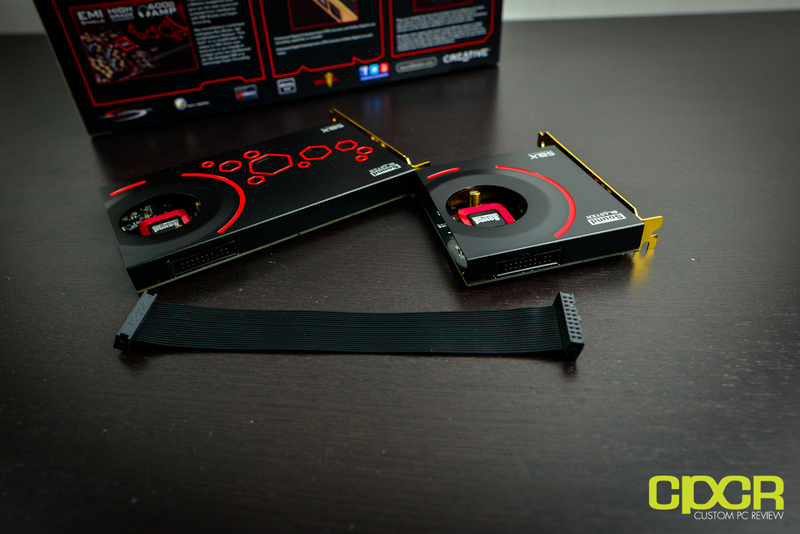 ASIO support is now included with the entire Sound Blaster Z lineup of soundcards, not just the Sound Blaster ZxR. 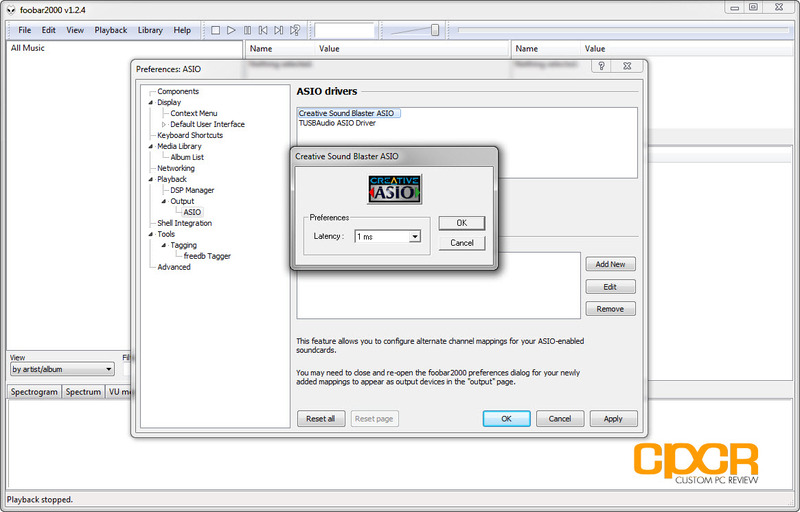 The ASIO driver allows for the soundcard to bypass the standard Windows audio stack, which allows for reduced latency and a more “pure” audio experience as it prevents the Windows audio stack from resampling the audio as it passes through. 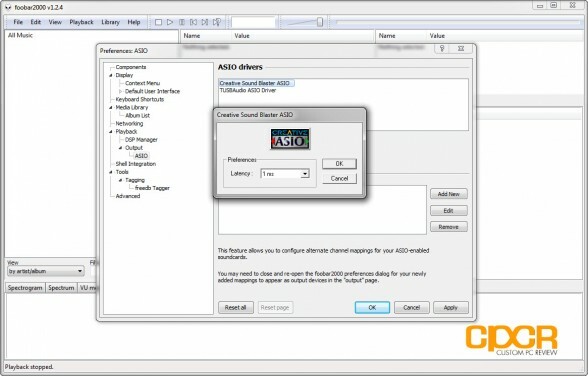 While I personally haven’t found this necessarily to be that important for audio playback, I think ASIO support can be very important for those interested in using the soundcard for recording purposes as small amounts of latency may cause timing issues in the final recorded product. Today we’ll be testing the Sound Blaster ZxR with the following setup. 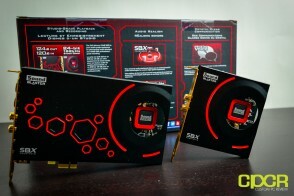 In gaming, I found that the Sound Blaster ZxR performed very similarly to the Sound Blaster Z. Audio imaging was very good and sound was extremely crisp and clear. The nice thing about the Sound Blaster ZxR is that many of the gaming oriented features from the rest of the Sound Blaster Z series of soundcards are present here as well. Scout mode for example significantly boosts the treble which allows for a slight tactical advantage while gaming as sounds such as footsteps and voices are more clearly heard. Additionally for voice chat in game and any general VoIP application for that matter, Creative’s Crystal Voice suite is extremely powerful. The suite includes a number of different features such as noise reduction, smart volume, acoustic echo cancellation, etc., which are all done in real time via the Sound Core 3D chipset. Many of these features such as noise reduction for example works far better than noise reduction systems in applications such as Skype for example and the nice thing about these features is that they work on any microphone that interfaces via a 3.5mm jack. One feature I find nearly indispensable now is acoustic noise cancellation as it monitors audio being played back in real time and cancels it out. This is useful feature especially during gameplay as it avoids having teammates hear in game audio coming out of your speakers and helps reduce/eliminate that dreaded sound loop caused by two people simultaneously using their speakers while on VoIP applications. For movie testing, I watched the stellar Blu-Ray edition of Skyfall, the latest film starring our favorite spy, James Bond. The Skyfall Blu-Ray includes a top notch DTS-HD Master Audio 5.1 soundtrack, which I feel is one of the most well done 5.1 audio tracks I’ve had the pleasure of hearing for quite a while. 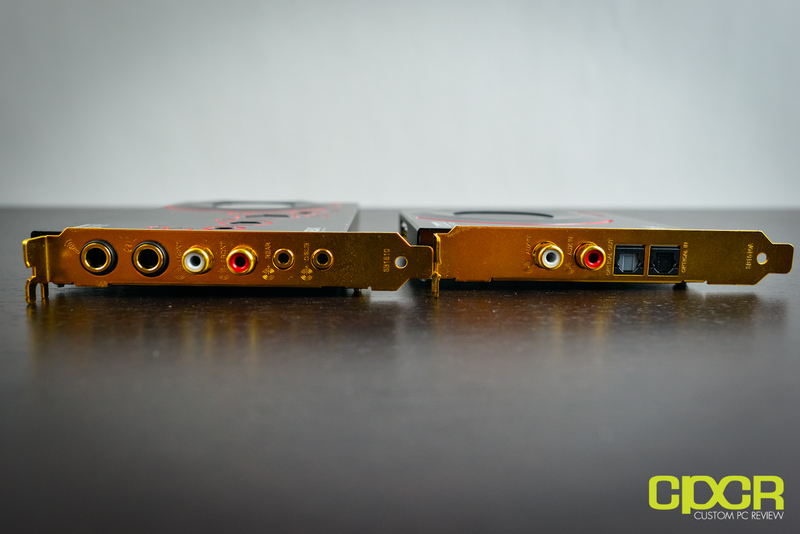 Comparing the onboard VIA VT2021 audio solution against the Sound Blaster ZxR, there was a distinct difference in audio clarity and crispness as well as a tighter bassline, which was quite apparent especially with the Audioengine 5+ speakers along with the Audioengine AS8 Subwoofer. With all of the audio processing features disabled and the Sound Blaster ZxR set to stereo direct mode, I spent quite a considerable amount of time testing the soundcard with a variety of music, and overall I was very pleased with its performance. Like what I experienced in gaming and movies, again the sound was crisp and tight here compared to onboard sound, which again was especially noticeable on the Audioengine 5+/AS8 combination. Additionally I also spent quite a bit of time testing the Sound Blaster ZxR with high end headphones and I found that the headphone amplifier worked very well driving the 600 ohm Beyerdynamic DT990’s, which I think is one of the bigger selling points of having a dedicated sound card as it eliminates the need for a dedicated headphone amplifier. Unfortunately it’s difficult to compare the performance of high end audio equipment using the Sound Blaster ZxR against onboard sound since onboard sound couldn’t properly drive the DT990’s. That said, using 32 ohm Logitech Ultimate Ears 6000 headphones, I found that in addition to added clarity and crispness, one thing about the Sound Blaster ZxR when compared to the onboard sound solution is that, hissing and white noise was greatly reduced, which generally indicates less interference and superior internal circuitry. It’s quite difficult to review the Sound Blaster ZxR without the whole thing kinda sounding like a review of the Sound Blaster Z or the Sound Blaster ZX, but I think the best way to think about the Sound Blaster ZxR is to think of it as a very highly upgraded Sound Blaster Z/ZX. Whereas performance between onboard sound and the Sound Blaster Z/ZX is very noticeable, I think the sound quality between the Sound Blaster Z/ZX and the Sound Blaster ZxR is a lot more difficult to discern, especially if you’re lacking enthusiast or audiophile grade listening equipment. Sadly like with anything, the law of diminishing returns applies to audio as well. Now, before I venture into my conclusions on the Sound Blaster ZxR, let’s spend a little bit of time talking about the Sound Blaster ZX first. Since my review of the Sound Blaster Z back in December of last year, I also had the opportunity to test the Sound Blaster ZX shortly after, and for those of you who caught my video unboxing of the ZX, you’ll notice that for the most part, the real draw of the ZX is the ACM module. 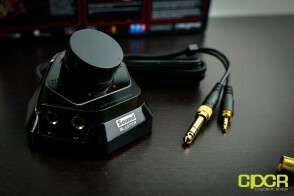 For those wondering where the review for the Sound Blaster ZX was, I didn’t feel a whole new review for the ZX made any sense since most of the onboard hardware on the ZX is completely identical to the Z (with the exception of the capacitors) and to be honest, I didn’t notice much of a difference in sound quality either. That said, the Sound Blaster ZX gets the ACM module and I think that’s the main value add for the ZX as it allows easy access to a high quality audio passthrough along with 1/4″ jacks for high end headphones/speakers. 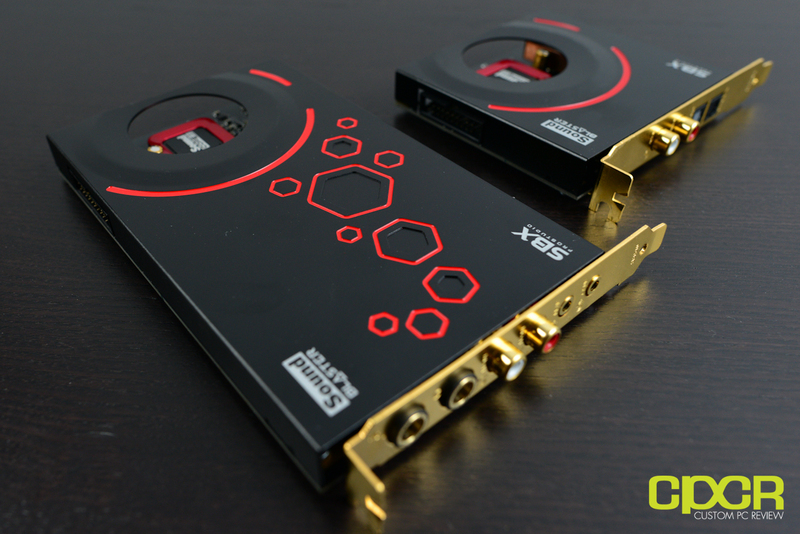 Alright, so moving back to the Sound Blaster ZxR, I can say that in terms of performance it’s easily among the best sounding and most versatile internal soundcards on the market. The versatility because the Sound Blaster ZxR, is technically an audiophile, gaming, and recording soundcard packaged into one and while it may not be the best at all three, it’s still very good at all three. 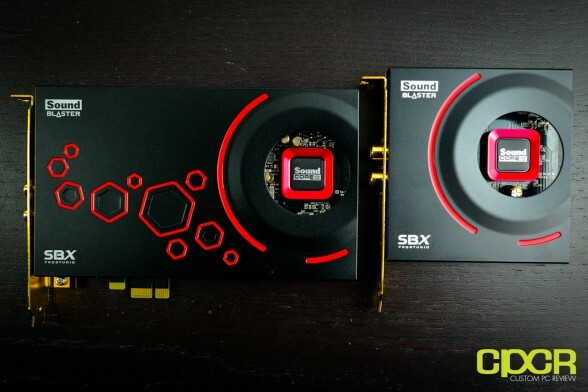 Of course with quality and versatility comes price and the Creative Sound Blaster ZxR will cost a pretty penny coming in at $249.99, making it one of the most expensive internal sound cards on the market. However like I said earlier, this soundcard isn’t meant for the average consumer – the Sound Blaster Z or the Sound Blaster ZX is. The Sound Blaster ZxR on the other hand is a product meant only for serious enthusiasts who already have high quality listening equipment and are trying to squeeze every ounce of performance out of them, or those who are looking for a soundcard for basic recording purposes such as single instrument or vocal recording. If that’s you, then I think you’ll find that the ZxR is worth every penny. If not, then your money may be best spent elsewhere such as getting that new pair of high quality speakers first. Worth to upgrade from Xonar D2X ? Haven’t used the D2X in depth, so I can’t say for sure. Probably won’t be enough of a difference to justify the cost of a ZxR. The ASUS D2X is pretty good and it has a dedicated Burr Brown DAC already. If you want the audio processing available from Sound Core, then it could be worth the upgrade, but for pure music listening, I don’t think it’ll be worth the cost.